Italian Renaissance Art 2 Edition Now thoroughly revised and updated throughout, featuring extended discussions of Mannerism and the expanding role of women in the visual arts and significant illustration program enhancements, Italian Renaissance Art is a readable, student-friendly, lavishly-illustrated introduction to one of the greatest periods of artistic genius in western history.Art historian Laurie Schneider Adams opens the text with the late Byzantine work of Cimabue and concludes with the transition to Mannerism. The author presents the most important and innovative artists and their principal works, with a clear emphasis on selectivity and understanding. 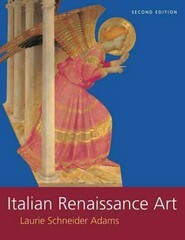 Italian Renaissance Art also focuses on style and iconography, and on art and artists, incorporating different methodological approaches to create a wider understanding and appreciation of the art.Distinguishing features of the second edition include:More than 400 images throughout the work, with over 300 in full-color. Over 50 images were changed from black and white to full-color for this edition. Illustration program now includes works by Correggio, Bronzino, and Pontormo.Large format illustrations retained for readability and visual access by students. Design changes make the text more attractive and readable.Connections,” with thumbnail images of earlier works, show the historical continuity of the images. Comparison” thumbnails have also been added for the purpose of comparing and contrasting later works with earlier ones.New treatment of Mannerism and the expanding role of women in the visual arts. Coverage includes Lavinia Fontana, Sofonisba Anguissola, and Properzia de’ Rossi, and a new feature box discusses the role of Isabella d’Este as an influential art patron and humanist.Maps, plans, and diagrams included throughout. Also features a historical chronology, a full glossary of art-historical terms, and a select bibliography.